CFO is pleased to announce a formal insurance relationship with Aviation Insurance Resources of Fredrick, MD, with the joint goal of improving coverage and reducing costs for Cardinal owners. AIR-PROS, as it is abbreviated, is licensed to operate in all 50 states and can handle the needs of all types of Cardinal Flyers, from student pilots in stock '68's to the high-flying turbo group. This relationship brings many benefits to the CFO membership. Primary among them is the active involvement of Joe Ruck an insurance professional with many years of experience. 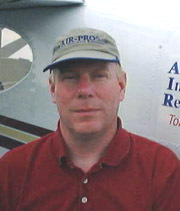 Joe is a CFI and commercial pilot, based in Thousand Oaks, CA from which he handles the western states for AIR-PROS. 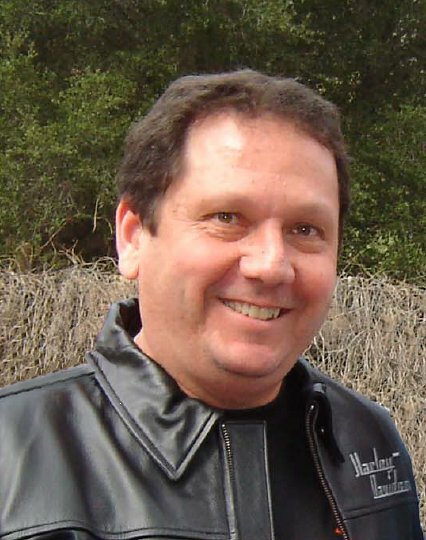 Joe is a former aircraft accident investigator and is also an expert on group programs such as ours. As you may notice from his picture, he also pilots a Harley. To contact Joe dial Phone: 805-341-5800 or Click here to send him an email. Also working to our benefit is Jon Harden, an active CFII and pilot who owns the agency. Jon Harden has a long history of serving pilots in a senior role at a major national agency. He is an active Commercial pilot and aircraft owner, previously owned a 1973 Cardinal RG and has been flying for more than 28 years. Aviation Insurance Resources is based in Frederick, MD, and their number one priority is customer satisfaction. They specialize only in aviation insurance, are licensed in all 50 states and work with all the aviation markets in the US. (not all brokers have access to all the companies like AIR-PROS). Joe and Jon bring together the knowledge required to find the best value for all of us, and they do it well. For instance, some members have had difficulty having specific needs met, such as smooth coverage, appropriate hull values for high-value aircraft, coverage for stock '68 models and coverage of special instructional flights. The CFO program has been able to obtain all of these 'extras' for CFO members. This brings extra leverage when negotiating for other Cardinal owners, and means you won't have to explain to or convince your agent of the need for such coverages or services. We expect to hear from Joe and Jon from time to time with information and perspective to help us all navigate the travails of our insurance needs. I suspect most of us desire to learn as little as possible while still meeting our obligations. Joe can help us do this with minimum effort. Keith, Debbie and Paul have placed our insurance with AIR-PROS. We have found the service to be excellent, the prices as good as possible and the support, both before and after the policy, to be outstanding. We have been walking this talk, and it has worked well for us. Fortunately, we have not had need to test claim responsiveness, although this is primarily a function of the underwriter. We are confident that if required, we will have an excellent advocate in Joe, Jon and the folks at AIR-PROS. You may be wondering if this means group rates and big discounts. We have worked hard for some time to make this possible, but as of this writing it still eludes us. We are simply not a large enough group to generate the economies of scale that drive most group rates, a fact we are slowly coming to accept as we hear it time and again. First, CFO members are more aware of maintenance and operational considerations, making us safer flyers and a better risk. Secondly, that the direct services of CFO, such as hands-on technical seminars and access to special training programs, make our members better supported and again a better risk than the average pilot. Third, that there are more of us than one might think, and we are more of a tribe than owners of mere Cessnas. The popular aviation press sees us as an unusually cohesive and inter-supportive bunch of people, and we think this helps make us a uniquely insurable group. We have made several proposals, including offering special programs developed in conjunction with the underwriters, type-specific training curriculums and so on. These assertions and proposals have been heard and considered by the right people with the right underwriters, and at times we felt close to sealing a deal. But the times and the timing has not yet been right for our efforts to be rewarded. We do not intend to stop trying. By joining the ranks of those insured through CFO, you will be supporting the effort and growing the numbers that CFO can bring to our discussions. In time, together, we hope to prevail. Hopefully our record will start to show, and perhaps we can prove our assertions with experience. In the meantime, although Joe may not get you a lower rate than you currently have, he will get you the lowest rate available. And he won't shrink from your 150 horse '68, low Cardinal time, training rider or smooth coverage request. Quotations can be requested from the CFO site, just click here and fill out the form. Please keep in mind that most underwriters will only quote through one agent, so ask here first, and ask early enough to get things properly set up. When the time comes to renew your insurance, we invite you to take a test flight with AIR-PROS, as well as Joe, Jon and CFO. We think you will be glad you did. Aviation Insurance Resources P.O. Box 2067, Thousand Oaks, CA.